We have eaten about 9 pounds of Wonderful Halo’s in the last month. So I have partnered with them for this post. All opinions are my own! My kids start stalking the produce section of our local grocery store about mid October. They know that come November Wonderful Halo’s will be back. I love when they want nothing more than fresh fruit for snacks, with meals, anytime. So once we first spot these little goodies, I buy them. These mandarin oranges are seedless, easy to peel, and make the perfect take along snack. Toss one in a lunch box. Or add to any meal for some fresh fruit. A sweet, seedless and easy to peel snack that’s a healthy alternative to fatty foods. About 50 calories delivering 45 percent of the recommended daily value of vitamin C.
Only available from November till April so get yours while you can! We were sent this great prize pack full of Wonderful Halos, a hat, lip balm, Halo themed keychain light, drawstring back pack, and lots of other fun goodies. The kids have already eaten all the Halo’s and have claimed all the goodies for themselves. I did manage to catch a whiff of the lip balm and it smells just like Halos. Win it! 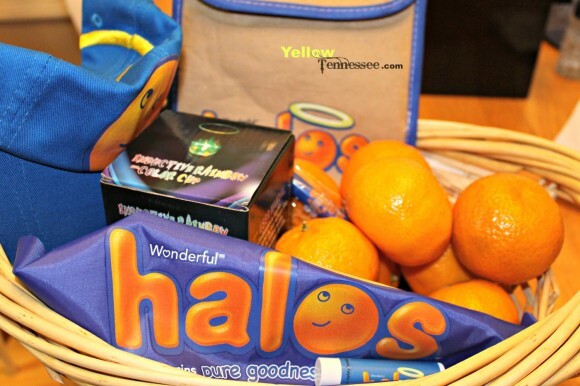 One reader will win a Wonderful Halo gift basket just like I received. Just use the simple Rafflecopter form to enter.